I am gushing over how good my Sunday has been. 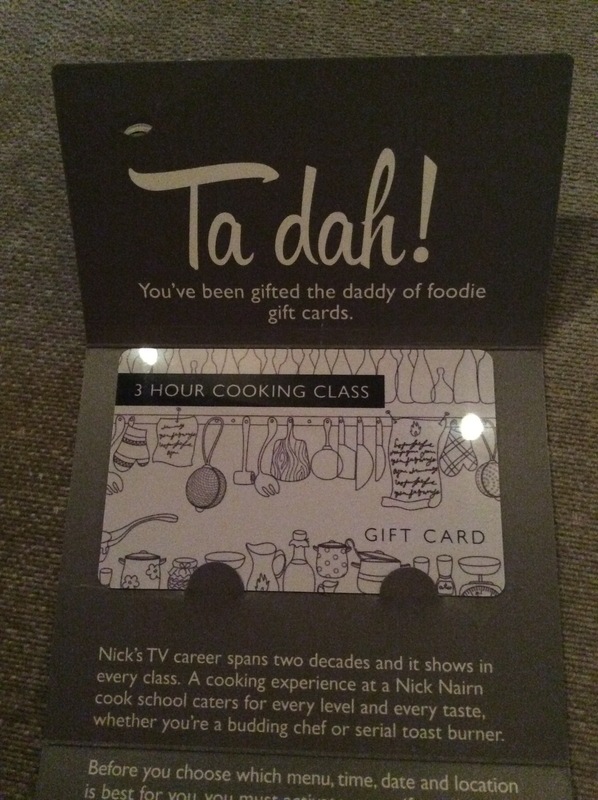 I received a very thoughtful Christmas present from my other half to attend a 3 hour cooking experience at Nick Nairn’s Cook School. 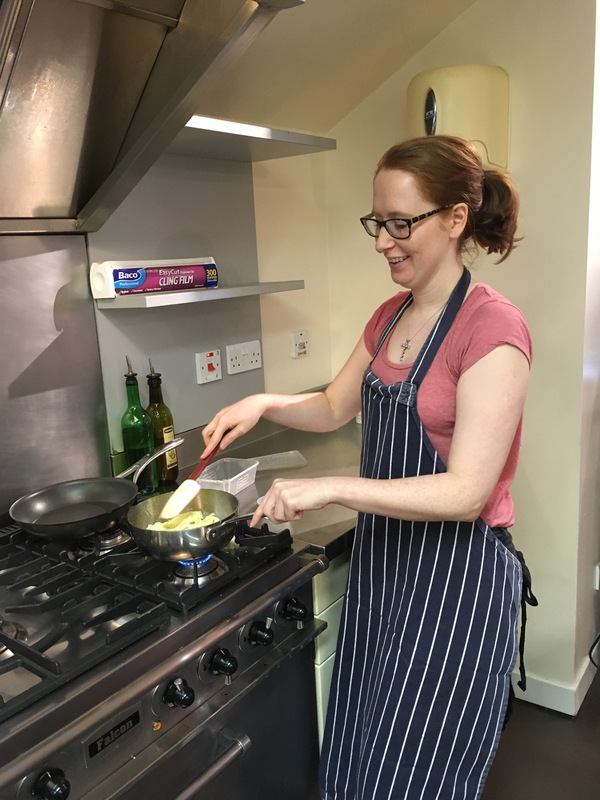 Now as you all well know, I am a massive foodie and it felt great to be on the other side for a change – being the student instead of the teacher. 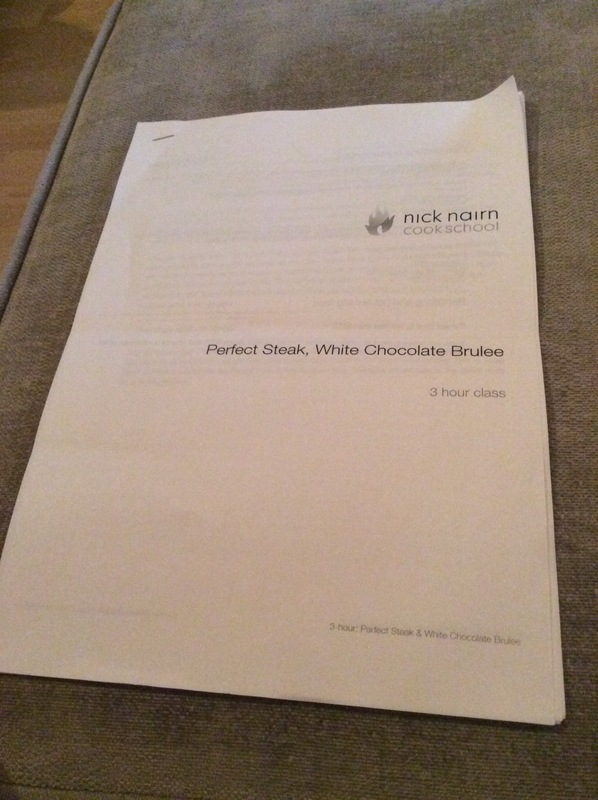 However I don’t know much about Nick Nairn himself! So here’s what I’ve found out…. Brought up in Port of Menteith (the location of one of his cook schools and the one I attended today), Nick travelled extensively in the Merchant Navy. His first restaurant was called Braeval near Aberfoyle, in the early 1990s he became the youngest Scottish chef to receive a Michelin star. He was on Ready Steady Cook and many cookery shows thereafter. He had a bust up with Gordon Ramsay and is an advocate of good Scottish food education. 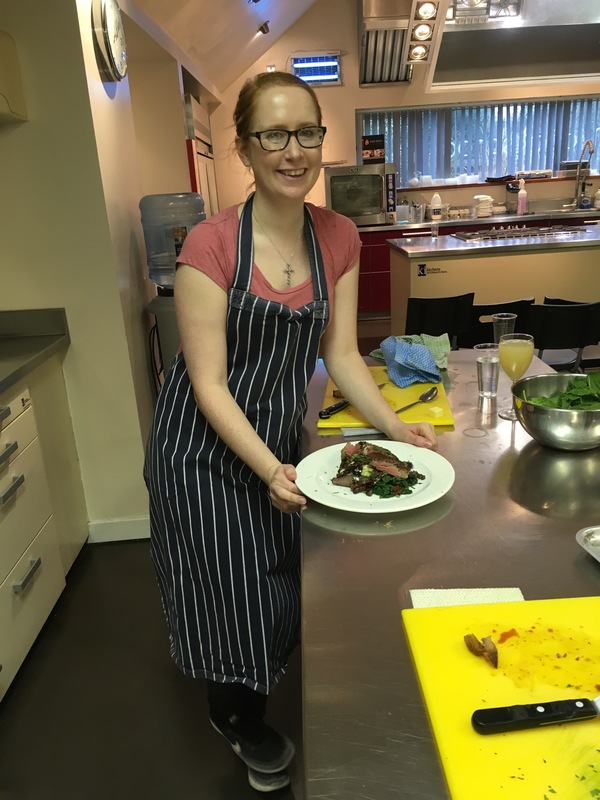 He loves Scottish seasonal produce and is behind the menu at the Kailyard restaurant within the Doubletree by Hilton Dunblane Hydro. 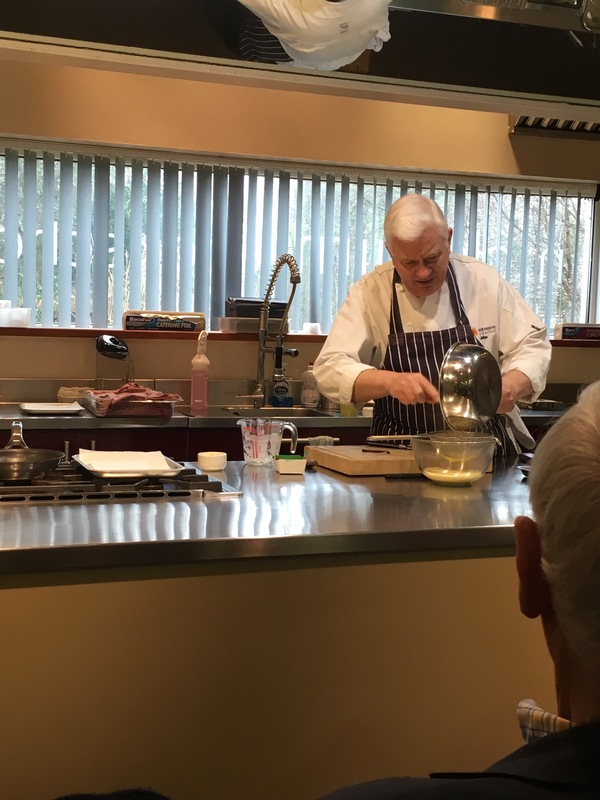 I had the choice of attending a 3 hour class at the centrally located Aberdeen cook school or the Port of Menteith location which involved a car journey. I decided a little jaunt to the country could be good on a Sunday morning and I selected my choice of class – Perfect Steak and White Chocolate Brûlée. Sunday 5th February from 11am – 2pm. It took me approximately an hour and 15 minutes to drive there and I arrived to a very warm welcome of tea/coffee and homemade shortbread to satisfy me as I waited. I made friends quickly and I was surprised by how big the class was, more males than females in attendance and a good mix of ages, some people had come with a friend or partner and some had come alone like me. 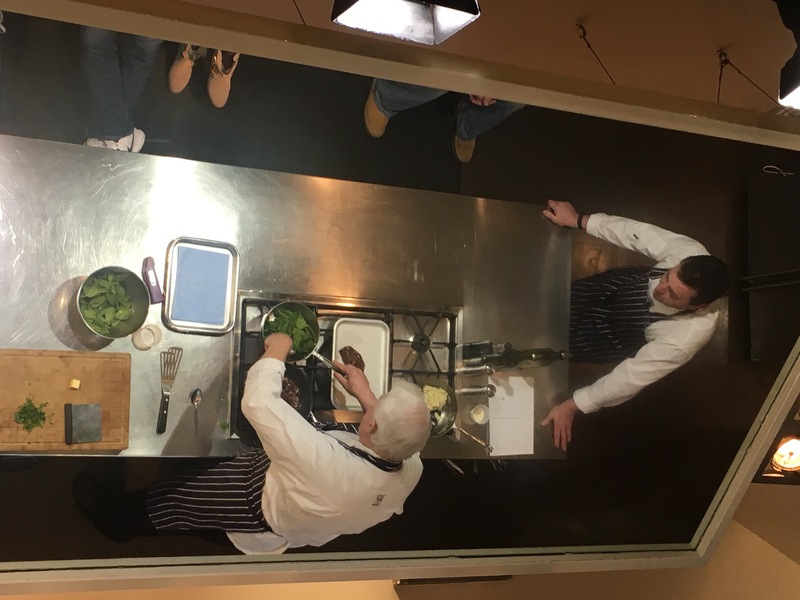 John welcomed us into the kitchen and we sat on some stools and watched him demonstrate the brûlée and steak dish. We were given recipes and tips to take away with us. The demonstration was very relaxed and John answered any questions that we had. We were able to see everything that was going on by looking at a mirror directly above John’s head. Alex was John’s sous chef. 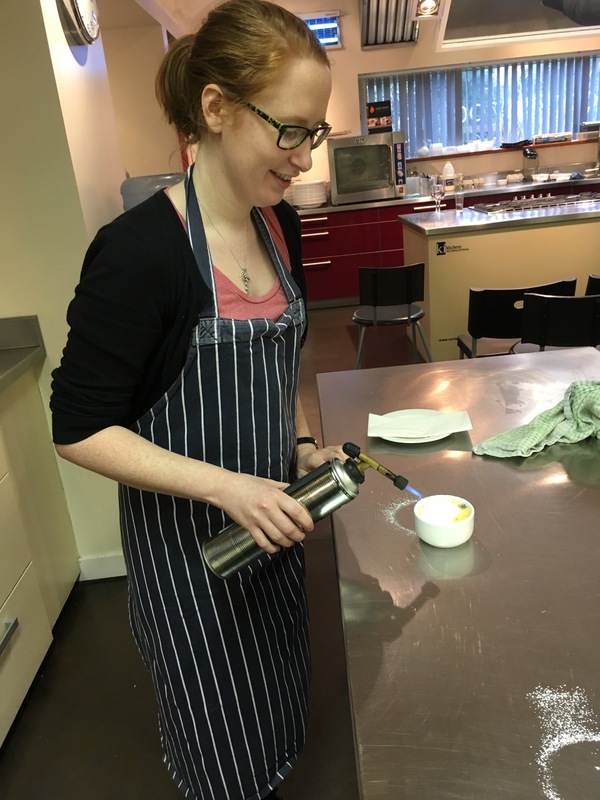 We were not going to be making the brûlée, we were shown how to do it and it had been prepared for us, we got to use the blow torch to caramelise the top. The steak however was our task for the day. 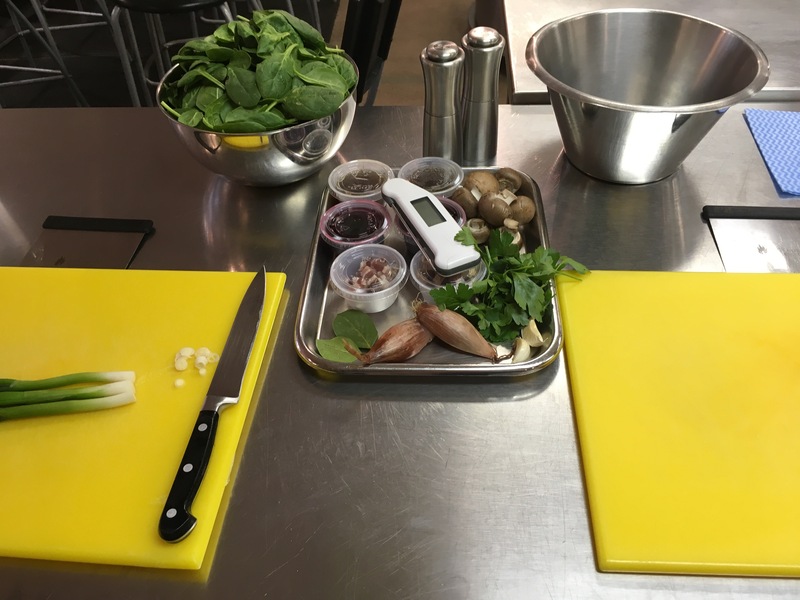 We were to work in partners to put the final touches to the mash that had been pre-made for us, by prepping and adding spring onions, butter and cream, we were also to wilt the spinach as a partnership. My partner was Douglas, his wife had bought him the experience as a Christmas present too. He was up for taking photographs of the whole cooking process as well which was great for me! The steak was to be cooked in a hot pan which we tested by splashing some water in it and waiting for the sizzle. 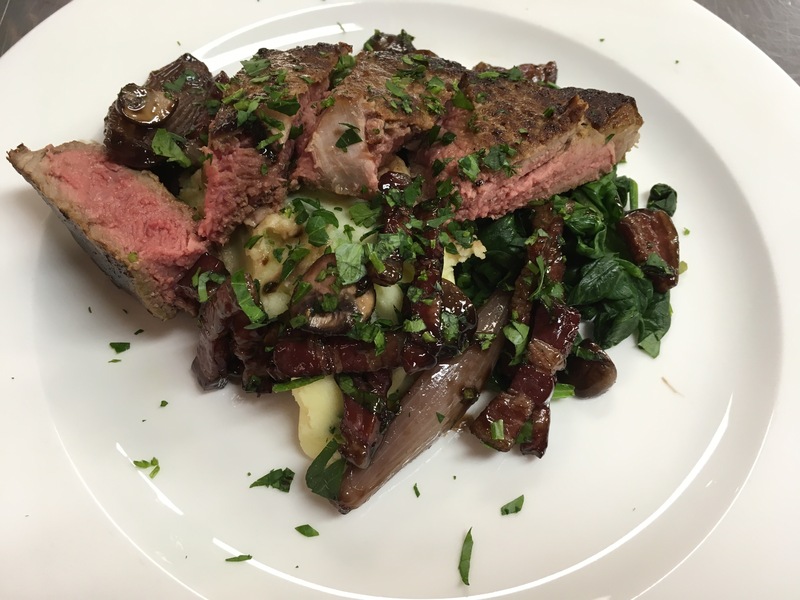 We started by cooking the side of the steak that had the strip of fat on it first. 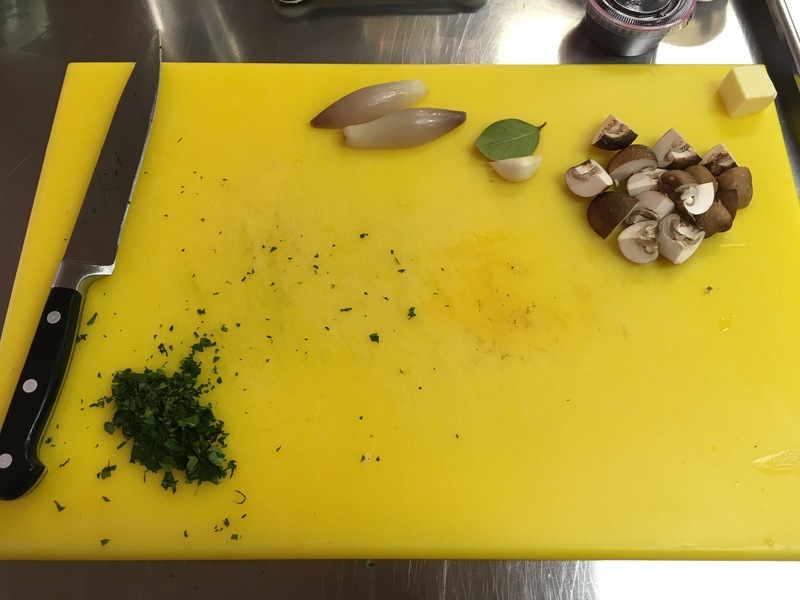 We were tasked with prepping our vegetables for the Bourguignon sauce. 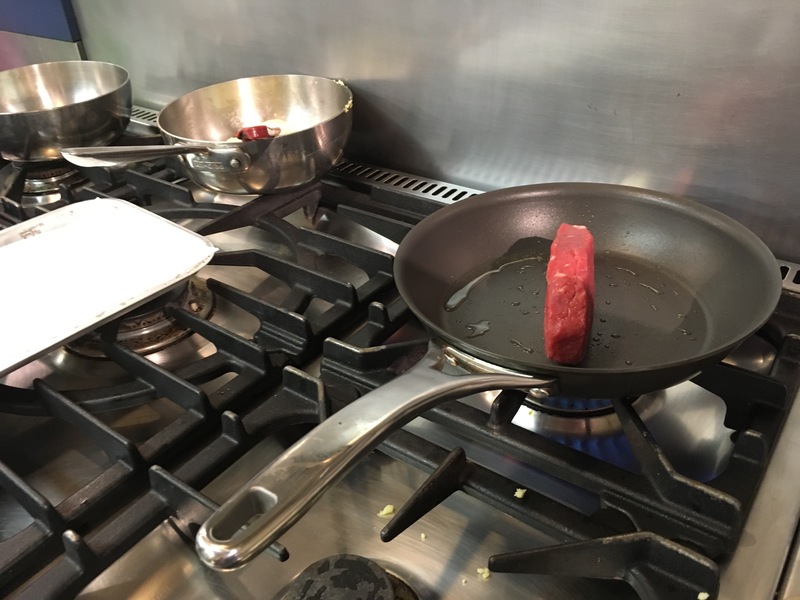 Once the steaks had been cooked to our liking (we tested this by using a temperature probe, with 45 degrees being the optimum temperature for a medium steak) we were to rest it. 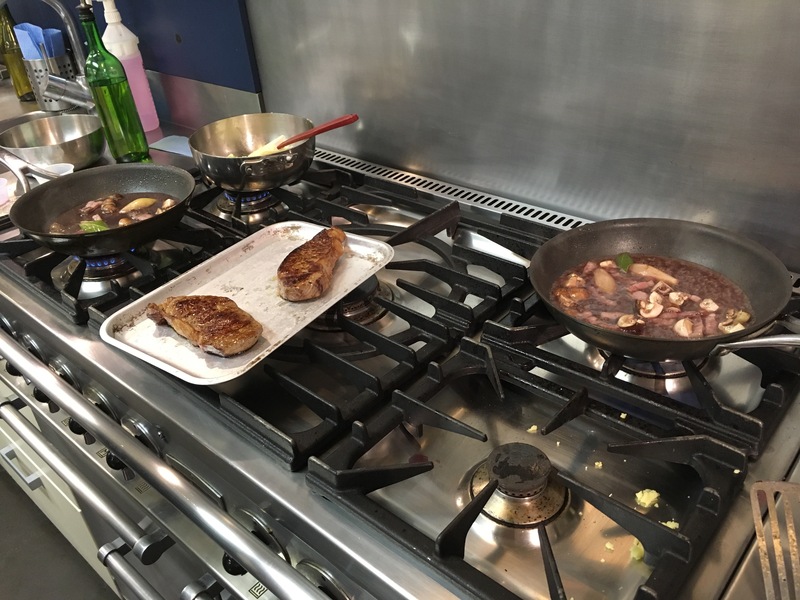 We added shallots, mushrooms, a bay leaf, pancetta, a clove of garlic, red wine and chicken and beef jus to the pan and reduced it until it started to thicken. Plating up, we placed the spring onion mash and wilted spinach side by side and scored the meat to allow the jus to seap through, before garnishing with chopped parsley. We then went to the dining room area where we ate together with wine if we so wished (unfortunately I was driving) or apple/orange juice. It was such a lovely atmosphere and while we ate, all our dishes were being cleaned for us! 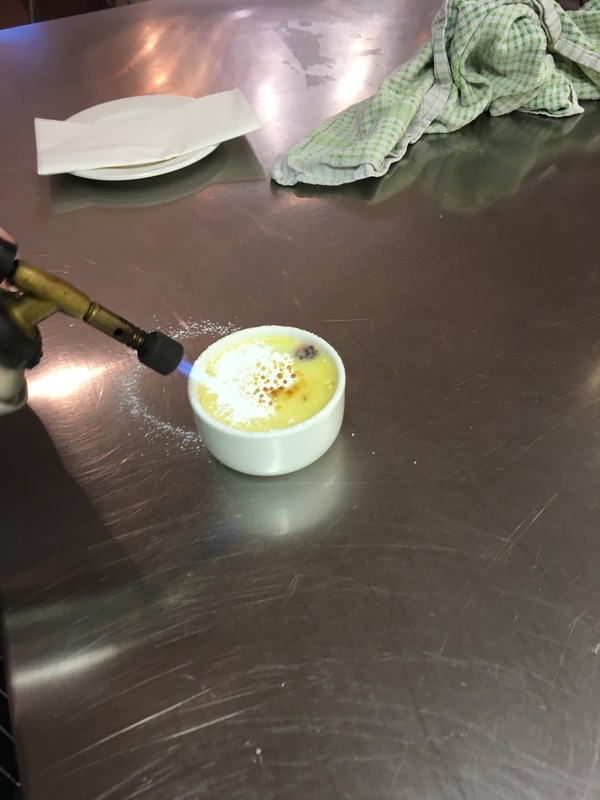 Next it was time to use the blow torch on the brûlée, after a little demonstration by John we were set free to use the blow torches, something I had never done before. 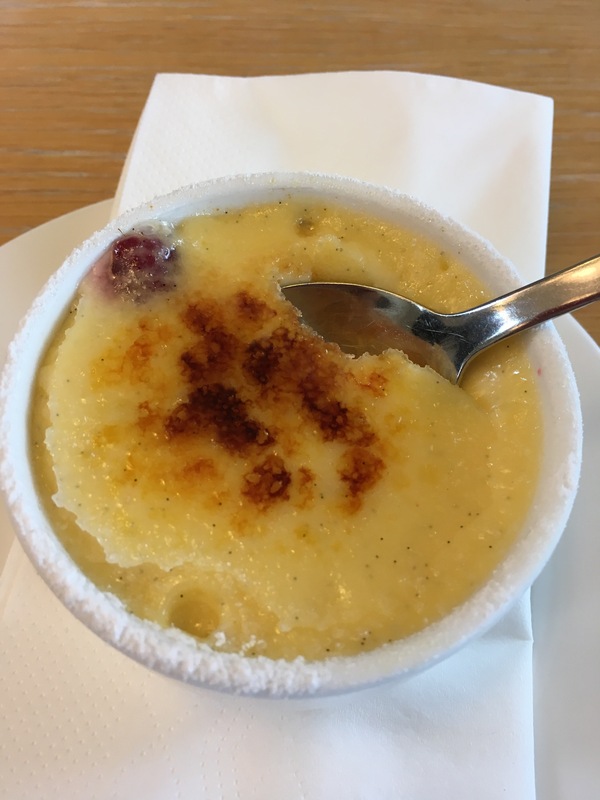 The White Chocolate Brûlée contained raspberries and it was a lovely creamy consistency with a hint of sharpness from the raspberries and crispness from the topping. We also sat at the dining table separate to the kitchen and enjoyed it over chit chat and laughter. This entry was posted in Alcohol, Chef, Crème Brûlée, Foodie, Gift ideas, Lunch, Scottish, Steak, Sustainable food, Treats, Uncategorized and tagged Crème Brûlée, Foodie, Steak. Bookmark the permalink.